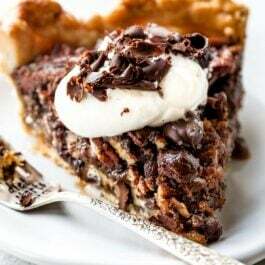 Maple syrup can replace corn syrup in this deliciously simple maple pecan pie recipe! Top with a little sea salt to balance out the flavors. Welcome to day 2 of Pie Week! It kicked off yesterday with Banoffee Pie and today we’re taking a trip down nostalgia lane with a classic Thanksgiving dessert recipe: pecan pie. Want to stay updated about Pie Week? Subscribe to my email (it’s free!) and never miss a recipe. 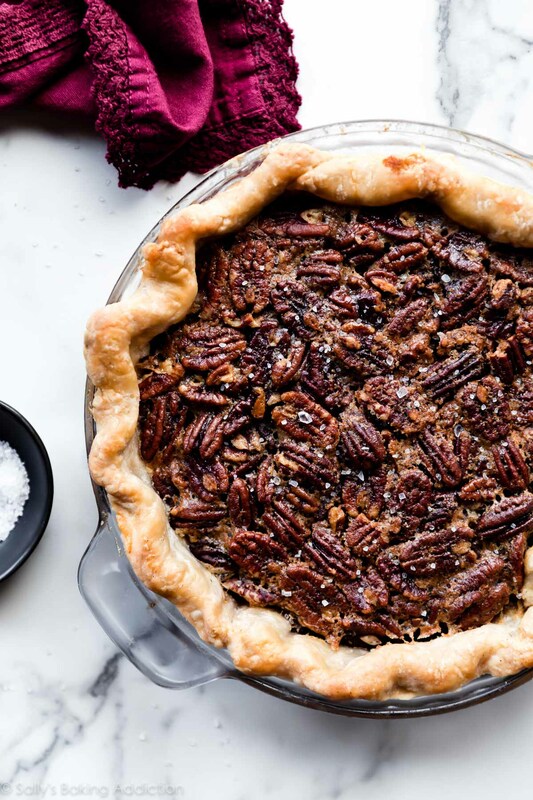 The most common question about pecan pie is: can I make pecan pie without corn syrup? My answer was always: yes, but the filling won’t really set or it won’t taste like pecan pie. So… no, you can’t. But that’s changing today. 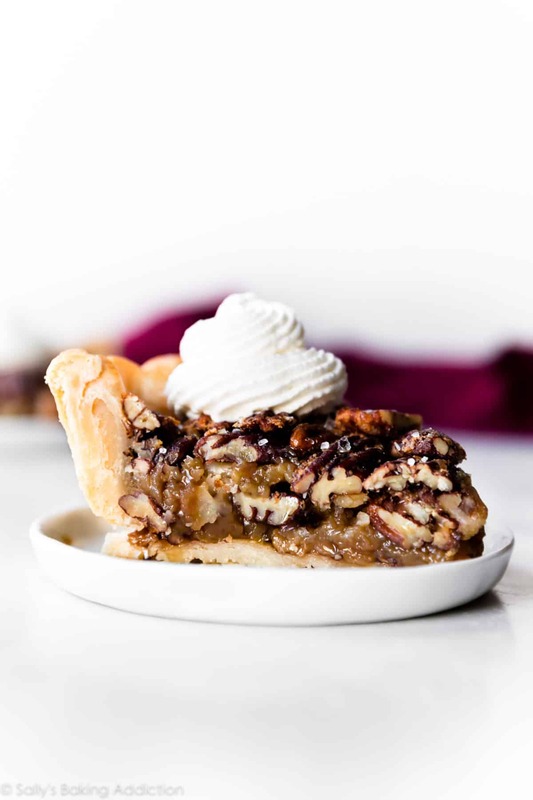 Introducing Maple Pecan Pie. 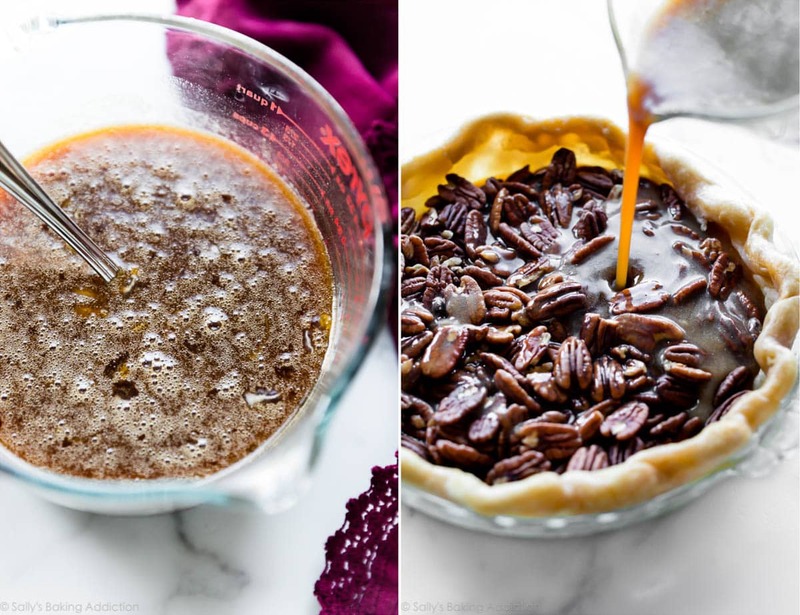 Corn syrup is the glue that holds pecan pie filling together. Thicker than other liquid sweeteners, corn syrup works with the eggs to help ensure your pecan pie filling will set. The problem is that more and more modern bakers are looking for an unrefined substitution for the corn syrup. My goal was to find a solution to not only find a corn syrup substitute, but to guarantee the pecan pie filling will SET and TASTE DELICIOUS. Maple Syrup + Flour Replaces Corn Syrup! Mixed with melted butter, 1 Tablespoon of flour thickens the pecan pie filling just as corn syrup would. The flour allows us to use a thinner liquid sweetener. Isn’t that incredible? 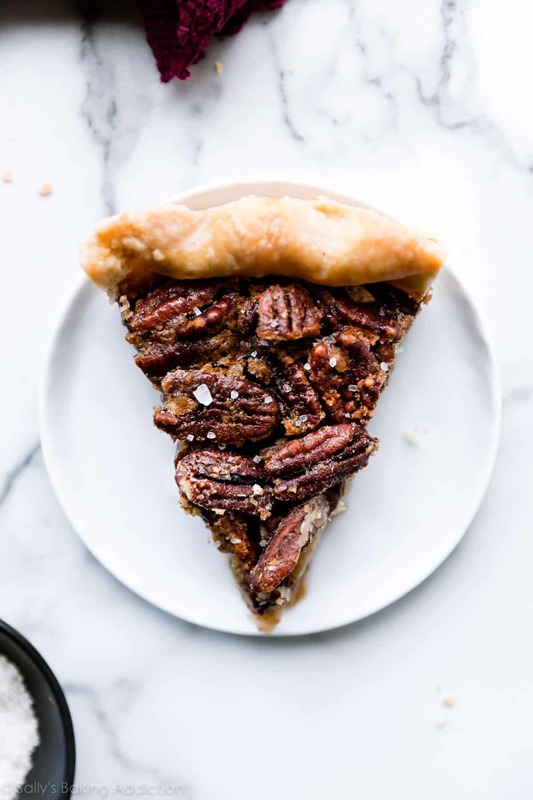 So all you’ll need to prepare this maple pecan pie are eggs, pure maple syrup, flour, butter, brown sugar, salt, vanilla extract, and pecans. 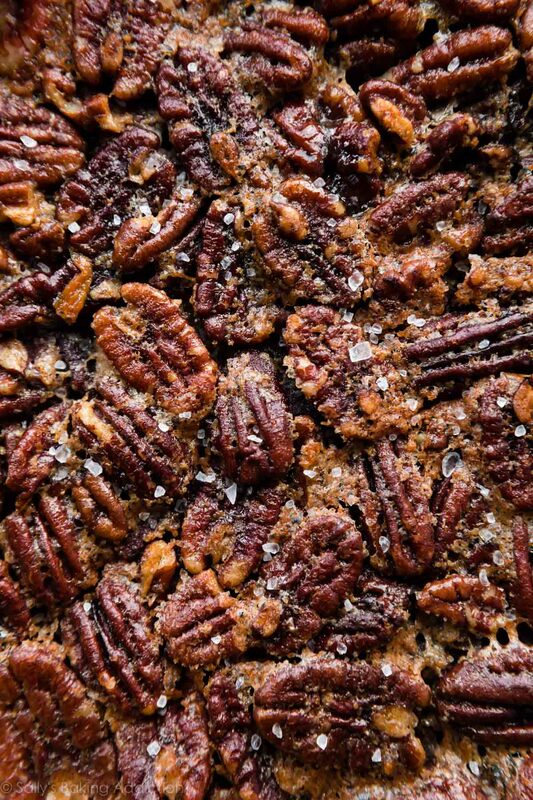 Simple, delicious, pure flavors gives us a maple infused + buttery sweet + deliciously thick slice of pecan pie. I ran into 1 problem during my recipe testing. 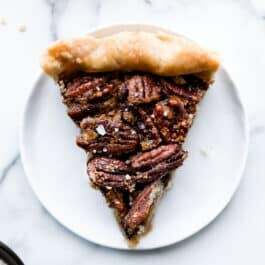 The pecan pie filling seeped through the bottom pie crust, lifting the entire bottom pie crust up into the center of the pie. It was the WEIRDEST thing. Frustrated, I almost gave up completely. Since the maple pecan pie filling is a little thinner than my regular pecan pie filling, I decided that pre-baking the pie crust was necessary. I shared an entire in-depth blind baking pie crust tutorial earlier this year, complete with a video and all my tricks. Use that to help you. You only need to blind bake the pie crust for about 15 minutes in this recipe. Easy. You can use my new all butter pie crust recipe or old faithful, my buttery flaky pie crust which uses a combination of shortening and butter. For the pictured pie, I used my buttery flaky pie crust. Brush the edges with egg wash before baking. Tell me about the sea salt! To balance out the flavor of this notoriously sweet pie, sprinkle a little sea salt on top prior to serving. I always recommend this! You’ll love the sweet and salty flavors, plus added crunch sea salt flecks are a nice bonus. I actually made this maple pecan pie for the 3rd time and took it over my in laws for a big family meal on Sunday to celebrate my SIL and BIL’s birthdays. It was more popular than the birthday cake!! Everyone scraped their plates clean. 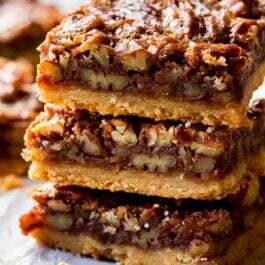 Before I leave you with the recipe, let me share my tips for freezing pecan pie. This is a wonderful dessert to make ahead of time to freeze for Thanksgiving. The baked pie freezes well for up to 3 months, tightly wrapped in a couple layers of plastic wrap or aluminum foil. Thaw overnight in the refrigerator and allow to come to room temperature before serving. You can also freeze the pie after you pour the filling into the cooled blind-baked pie crust. Freeze for a couple hours to set the filling, then tightly wrap the entire pie in 2-3 layers of plastic wrap or aluminum foil, then freeze for up to 1 month. When ready to bake, remove from the freezer, unwrap, and bake for about 20 minutes longer. Stay tuned for more pie recipes all week long for Pie Week! The crust: Prepare my pie crust recipe or butter pie crust through step 5. After the pie crust has chilled, adjust the oven rack to the lower third position and preheat the oven to 350°F (177°C). Roll out the chilled pie dough and blind bake: On a floured work surface, roll out one of the discs of chilled dough (you can freeze the 2nd for later use, see note). Turn the dough about a quarter turn after every few rolls until you have a circle 12 inches in diameter. Carefully place the dough into a 9-inch pie dish. * Tuck it in with your fingers, making sure it is smooth. Flute or crimp the edges of the crust. Chill for 20 minutes in the refrigerator or freezer. (Crust will shrink otherwise!) Line the chilled pie crust with parchment paper or aluminum foil. Fill with 2 sets of pie weights or dried beans. Bake for 15 minutes. Remove pie from the oven and carefully lift the parchment paper/aluminum foil (with the weights) out of the pie. 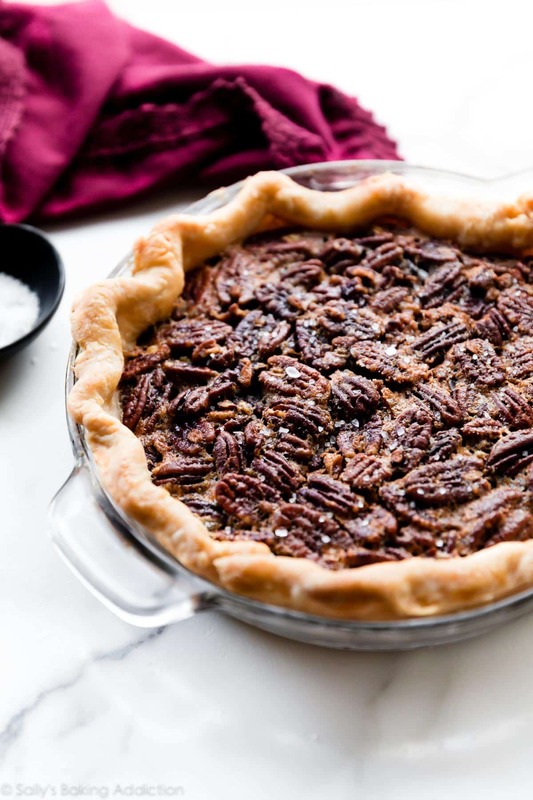 The filling: Carefully spread pecans evenly inside warm pie crust. Set aside. Whisk the melted butter, brown sugar, and flour together in a large bowl until combined and thick. Whisk in the vanilla extract, salt, eggs, and pure maple syrup until combined. Pour evenly over pecans. Bake the pie for 40-50 minutes, or until the top is lightly browned. After the first 20 minutes of bake time, place a pie crust shield on top of the pie to prevent the edges from browning too quickly. You can also tent a piece of aluminum foil over the whole pie if the top is browning too quickly. Remove finished pie from the oven and sprinkle sea salt on top. Place on a wire rack to cool completely. The pie filling will set as it cools. Slice and serve pie at room temperature. Top with whipped cream, if desired. (I used Wilton 8B Piping Tip.) Cover and store leftover pie at room temperature for 1-2 days or in the refrigerator for 4-5 days. 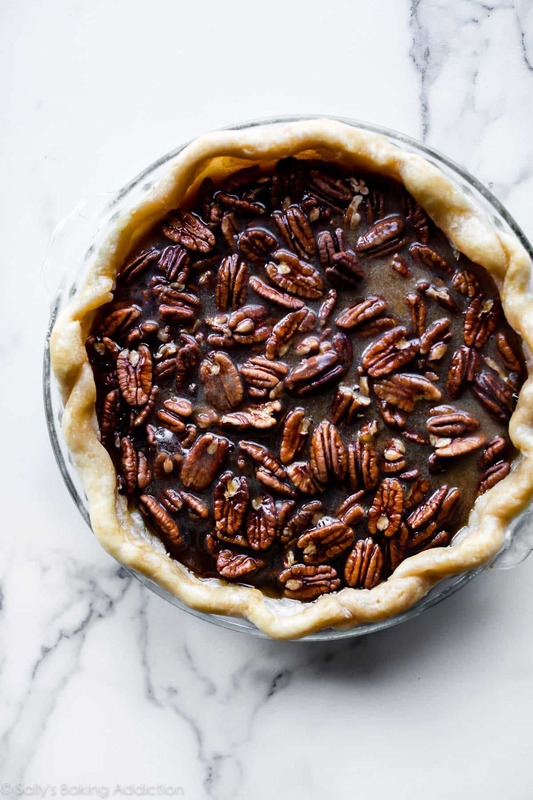 Make Ahead Instructions – 1-5 Days Ahead: You can get started by combining all the filling ingredients (except the pecans) one day ahead of time. Keep it covered tightly in the refrigerator until ready to assemble the pie. You can also make the pie dough 1-5 days in advance since it needs to chill. If you want to bake the pie 1 full day in advance, bake it as directed, allow it to completely cool, then cover tightly and keep at room temperature until ready to serve the next day. Make Ahead Instructions – Freezing: The baked pie freezes well for up to 3 months, tightly wrapped in a couple layers of plastic wrap or aluminum foil. Thaw overnight in the refrigerator and allow to come to room temperature before serving. You can also freeze the pie after you pour the filling into the cooled blind-baked pie crust. Freeze for a couple hours to set the filling, then tightly wrap the entire pie in 2-3 layers of plastic wrap or aluminum foil, then freeze for up to 1 month. When ready to bake, remove from the freezer, unwrap, and bake for about 20 minutes longer. Freezing Pie Dough: You can freeze the 2nd pie dough for up to 3 months. Thaw overnight in the refrigerator before using. Cornstarch: 2 teaspoons of cornstarch work as a substitute for 1 Tablespoon of flour. Make sure the cornstarch is completely mixed in with the melted butter and brown sugar. Pure Maple Syrup: Use pure maple syrup, not breakfast syrup. Any variety of pure maple syrup is great, from golden to dark amber. Use what you love best. Pie Dish: I strongly recommend a glass pie dish so you can see when the crust on the sides is browning, which signals that the pie is finished. Room Temperature Ingredients: Make sure you use room temperature eggs. Cold eggs will solidify the butter and you’ll be left with random chunks of butter in your filling. Some of the links above are affiliate links, which pay me a small commission for my referral at no extra cost to you! Thank you for supporting Sally’s Baking Addiction.